I’m an avid reader of fiction and not usually crazy about non-fiction or biographical books. I tend to flip through them, scan and read what I like, leaving the rest. 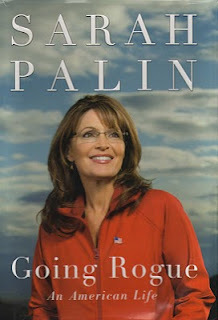 As a fan of Sarah Palin, I wanted to get her book, but expected to treat it like others in its genre. With Going Rogue, however, I found myself reading the entire book cover to cover and not skipping a word. I enjoyed learning more about Alaska than I’d ever known before, and grateful to gain knowledge of a political process that previously left me disinterested. Unlike so many famous people who use ghost writers for their biographies, Sarah is an excellent writer and I believe primarily penned this herself. She candidly talks about her family and her journey into and through the pitfalls of politics. Although this book reflects it well, I didn’t need convincing to believe in her integrity. Now, if anything, I believe even more strongly in this moral, common sense woman’s goals for our country. It’s too bad this book can’t be made a “must read” in all high school curriculums. It’s not that everyone should be required to learn more about Alaska, as fascinating as that is … but to better understand the workings of politics from the local level all the way to the top. Sarah Palin’s optimism for our country is very encouraging. This book deserves open-minded consideration regardless of your politics. The next few years will be crucial for the United States, and I highly recommend this book to everyone.